Sky News devotes some time every week to look at which crowdfunding campaigns are hot in the popular social media streams. One of their top picks is a campaign that exceeded £2.2 million since it was launched, and is expected to make a few more bob before closing on the 3rd of March 2015. This campaign is not only trending, it achieved over 4,000% more than what it set out to, long before the closing date. A trending crowdfunding campaign is every budding entrepreneur's dream; a campaign like this is like winning the entrepreneurial lottery. The company consists of two American entrepreneurs, an industrial designer and surfer called Storm Sondors and his partner Jon Hopp. Not much is known about Jon besides him being a 'manufacturing design genius'. According to Indiegogo the team decided that Storm Sondor's name is too cool not to name the product after him. Jonathan Chaupin is the man behind the crowdfunding campaign. The Sondors eBike is punted as the world's most affordable electric bike. It is a gorgeous piece of kit available in a range of colors. Riders will apparently be able to travel up to 20 mph for up to 50 miles per charge, and it takes around 90 minutes to charge the eBike's lithium ion battery. A relatively lightweight bike at 55 lbs, the Sondors eBike is all-terrain and is due to make its eagerly awaited arrival in May 2015. Although there are many other electric bikes around, the intrepid team claims that the Sondors eBike is unique because it is a top quality product, despite being a lot cheaper than other market offerings. Cheap? Just how cheap is this funky electric bike? 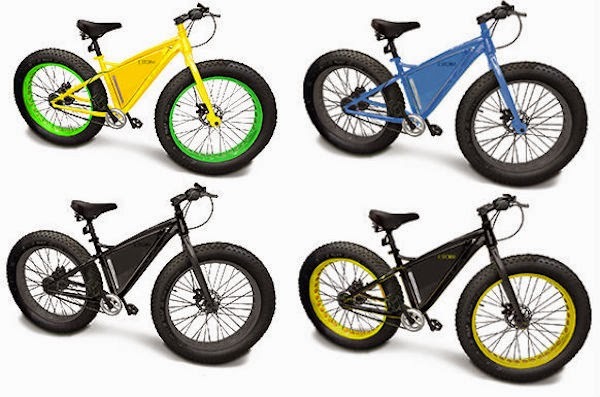 The Sondors eBike is available on Indiegogo for a donation of £453 or for £1,182 for a family pack of four bikes. I wouldn't mind a family pack for myself, one in every color, thank you!